In the run-up to the San Francisco 49ers' season opener Monday night at Levi's Stadium, much of the buzz was about whether or not Colin Kaepernick would continue his protest during the national anthem. The 49ers backup quarterback did not disappoint, taking a knee again during the playing of "The Star Spangled Banner" before the team's Monday Night Football game against the Los Angeles Rams in Santa Clara. 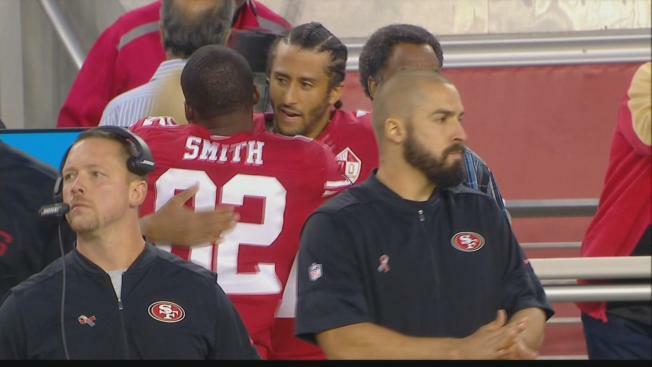 Kaepernick was again joined by teammate Eric Reid and got support from a couple of Rams players standing but raising their fists. Before the game, there were about half a dozen protesters outside Levi's Stadium passing out fliers containing photographs of black men killed by police - and an American flag on the ground. "There’s a lot of people who support Kaepernick, but there are some who oppose him, what he did," said protester Raphael Kadaris. "But most are in support of what he did." Not everyone agreed with the Kaepernick supporters. "We have people who served; it’s very sad," Valerie Valdez said about the protesters. "He is sitting on the American flag, and that’s not right." As for 49ers fans arriving at the stadium hours before the game, they said they have Kaepernick fatigue and just want to see some good ol' fashioned football. "It's more about the game," 49ers fan John Murphy said. "I'm not really worried about what he's doing." "We’re here for football," fellow fan Danny Soria said. "We’re not here for anything other than that." On Sunday, a slew of players across the NFL joined Kaepernick’s protest before their games, some kneeling, others interlocking arms or raising a fist during the national anthem. Nearly all of them called their act a gesture of solidarity to what Kaepernick calls a protest of racist police tactics nationwide. NFL commissioner Roger Goodell commented on the growing protest, saying the league encourages its players to be respectful, "but they also have rights, and we have to respect that." Meanwhile, the Santa Clara police union initially threatened to boycott the games at Levis Stadium, saying the Kaepernick's blanket statements about police were insulting, misguided and hostile. But the union had a change of heart, and officers have said they will suit up. "We have very professional officers here in Santa Clara," Lt. Dan Moreno said. "They volunteered to work. They realize the safety of the community, the fans, the players, the referees are of utmost importance to us. So they volunteered to work."